Great White Trillium, A Wonder in the Early Spring. The name of the White Trillium refers to its three petals and three leaves. It is a perennial plant growing low to the ground in partially shady woodland areas. The White Trillium blooms large white petals in the early spring. They often appear pink as petals age and are followed by fruits in the summer. The fruits are mealy, but the leaves of the Trillium are edible and are said to taste like Spinach, which some people pick the leaves sparingly and cook to eat. It is essential to protect and cultivate these native plants that are a wonder in the early spring. To have these beauties grow year after year in the spring, plant them in the fall in the understory of a tree in the backyard to create its natural habitat. Great White Trillium will look beautiful planted into gardens and a natural area. Great White Trillium will thrive and do well in moist well-drained soils. The blooms on the Great White Trillium will begin as white, and when they are pollinated, they will have a pinkish color to them. 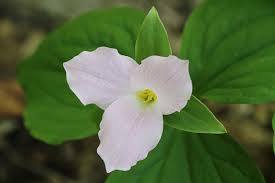 Great White Trillium has incredible similarities to the dogwood flower. Because of its white, yellowish colored petals. Its green inside and the size of the bulb. This flower would be a great addition to your yard. Because of its bright color and flowers; So if your interested in getting these flowers go for it there great. Great White Trillium grows best in shady areas; direct sunlight could hurt the plant's foliage. The blooms are a gorgeous white, and they stand out against the plants darker green foliage. Along with the flower being a beautiful white color, it has some yellow in the center, and the leaves also have lighter colors on them. The flowers grow to be just over a foot tall and under a foot wide; If you plan on planting this make sure that the soil is moist and well drained. When the Great White Trillium gets into direct sunlight the leaves will turn brown and fall off, the blooms can get scorched, so planting them in partial shade is recommended.